A Sukhoi Superjet 100 (SSJ100) suffered a hard landing at Gromov Flight Research Institute’s test aerodrome in Zhukovsky near Moscow after its right main gear failed to fully extend during a test flight late last week. 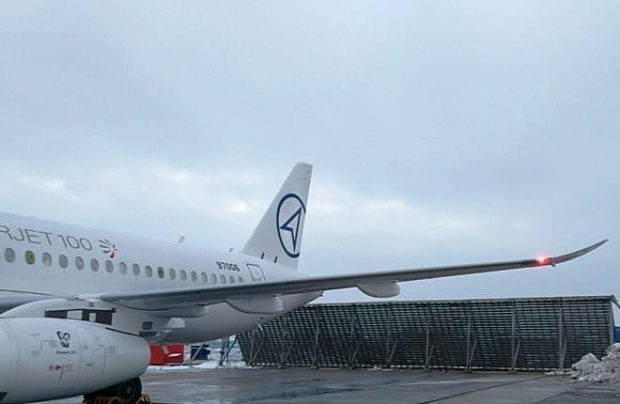 The test aircraft, a Sabrelet-fitted SSJ100LR long-range version, with registration number 97006, sustained what the Russian manufacturer describes as “unsubstantial” damage in the incident and will return to the testing programme after repairs are carried out on a landing-gear strut. An informed source reveals that the right landing gear strut needs repair. The incident is under investigation. The aircraft was performing a test flight to evaluate the aerodynamic qualities of the Sabrelet blended winglets, which are expected to improve the aircraft’s fuel-burn by three per cent. After the flight test programme was complete, the right main landing gear failed to deploy completely, resulting in the hard landing. Even though the aircraft landed with partially-deployed gear, the starboard engine did not contact the runway. “After fuel depletion, the landing was performed safely to the prepared runway,” the manufacturer comments. The landing, which was made by a test pilot who had logged 3,040 hours on the SSJ100 type (11,450 hours of total flight time; 1,600 of test flight duration), also had amongst its crew a flight test engineer and a certification expert. None of the three were injured. The SSJ100 commenced flight-testing of the Sabrelets late last year. The aircraft – with serial number 95032 – was assembled in February 2013 and has so far logged 535 hours in 294 test flights. The latest stage of the certification test programme – aimed at evaluating the aircraft’s performance at high angles of attack – commenced in March of this year. The new winglets are also designed to improve the aircraft’s runway performance and its handling characteristics. They are expected to reduce fuel consumption and increase flight range to 7,000 km. The structure will be available on new aircraft, or as a retrofit option.